Business has been picking up for one of Burnaby’s newly-established floating services. 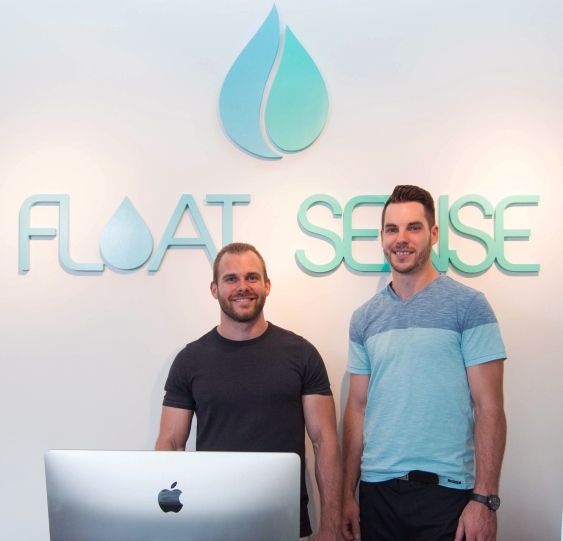 Craig MacGregor and Randy Nyholt opened the doors to Float Sense – located at 6540 Burlington Ave. – on Canada Day. Since then, the entrepreneurs say they average about eight to 10 clients a day, about double compared to July’s numbers. “It’s definitely more than we anticipated,” MacGregor told the NOW, adding renovations are underway for a possible fourth tank to compliment the three already on site. Floatation – where subjects get inside a soundproof tank to float in salt water at skin temperature – was first used in the 1950s to test the effects of sensory deprivation. Today, many use the therapy for relaxation, meditation and for chronic pain and illnesses like anxiety and fibromyalgia, MacGregor said. He and his business partner (who also happens to be a childhood friend) first heard about floatation a couple years ago after listening to a Joe Rogan podcast. The pair, who were living in Edmonton at the time and working in construction and personal training, decided to try it out. Other benefits, he added, included a shorter recovery time between his workouts. “It didn’t take long after our first couple of experiences where we were like, ‘Hey, let’s put together some kind of business plan, so we can share this practice with everyone.’ We decided Burnaby was the right place. I knew the area pretty well, and I knew the general population was a little more open-minded to that type of thing,” MacGregor explained. Many first-time clients, however, are skeptical, he noted. Battling skepticism, and claustrophobia even, can be achieved by explaining the floating process, MacGregor said. MacGregor likened flotation to yoga, where those who practice it must commit to a regular schedule to see results. Float Sense’s three tanks are heated to 93.5 degrees Fahrenheit and are filled with 10 inches of water that contains 800 pounds of dissolved Epsom salt. A session costs around $70, but there is a $39 introductory float being offered at the moment. For more information, visit www.floatsense.com.